Jeffrey Bennett's storybooks, including "Max Goes to the Space Station" launched to the real International Space Station on Orbital Sciences' Cygnus cargo ship in January 2014. The science-packed, storybook space adventures of a dog named Max are blasting off in real life to be read on board the International Space Station (ISS). The astronauts will record reading the books for children to enjoy and learn from back on Earth. The books, which are part of a new educational program called "Story Time From Space," are launching aboard an Orbital Sciences' unmanned Cygnus spacecraft along with science experiments and supplies destined for the space station. 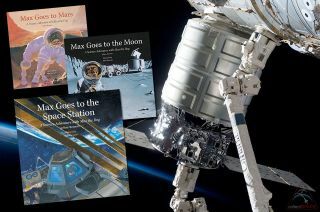 The five children's books, which include "Max Goes to the Space Station," "Max Goes to the Moon" and "Max Goes to Mars" form the complete library of "science adventures" by astrophysicist and author Jeffrey Bennett. Each book covers a different set of science concepts tied to a story, which Bennett says provides "education, perspective, and inspiration" for children and adults alike. It was with those same themes in mind that astronaut Al Drew and educator Patricia Tribe came up with the idea for Story Time From Space. "What you cannot imagine, you cannot do," Drew said in a statement. "When the [1960s] Apollo missions blasted off and went to the moon, I was right there with those crews – landing lunar modules and cantering along on the surface of the moon. Story Time From Space is intended to ignite children's engines of adventure, imagination and curiosity and to let those engines take them to any place and time of their choosing." Drew tested the idea while flying onboard the final mission of the space shuttle Discovery, STS-133, in 2011. While in orbit, Drew read from a digital copy of "Max Goes to the Moon." That book, and later the entire "Max" series, was chosen for Story Time From Space because of the way in which it combined science with a story. In addition to having a plot suitable for young children, the books also feature science focused sidebars, called "Big Kid Boxes," which engage older students, as well as their parents and teachers. The combination of a story with science made Bennett's books the "perfect springboard" for Drew's and Tribe's goal of blending literature with science, technology, engineering and math (STEM) education. "STEM and literacy are both very important for our future" Tribe remarked. "By combining them in Story Time From Space we can help teachers and families accomplish both without sacrificing one for the other." An Orbital Sciences Antares rocket is seen on Pad 0A at NASA's Wallops Flight Facility in Virginia in advance of its planned Jan. 8, 2014 launch of a Cygnus cargo ship to the space station. Aboard the International Space Station, astronauts during their free time will record videos of themselves reading the stories from inside the multi-windowed cupola, the Earth below serving as their dynamic backdrop. The resulting videos will then be sent back to the ground for distribution to classrooms. In addition, as Story Time From Space continues and as more equipment is launched, astronauts will record videos of science demonstrations that complement the concepts presented in each of the books. Veteran Canadian astronaut Bjarni Tryggvason, who is a member of the Story Time From Space team, is designing the science demonstrations that will be flown to the space station. For this first flight, in addition to Bennett's existing books about the dog Max and his adventures on the moon, Mars and Jupiter (as well as a separate title, "The Wizard Who Saved the World" about the Earth's climate), Bennett and Drew worked together to write "Max Goes to the Space Station" about the actual International Space Station. The book, which will be the first to be read in space, serves as prequel to Max's other adventures. The Story Time From Space team worked with the Center for the Advancement of Science in Space (CASIS), the nonprofit charged with managing U.S. science research on the space station, to arrange for physical copies of books to be launched to the orbiting laboratory. "CASIS, through its educational team, provides access for students and educators to the unique environment of the space station by creating an extension to the classroom through real-world science investigations and this type of program lends itself nicely to that," Diane Matthew, STEM education senior project manager for CASIS, explained in an interview with collectSPACE.com. "It is not just book reading, but it is physics and science demonstrations that compliment the content in each book." The decision to launch physical books, rather than uplink ebooks to the space station, harkened back to a common early childhood experience. "The [crewmembers] will be videotaped opening up the big hardcovers and it'll be just like when you're in kindergarten or first grade and the teacher has the hardcover book to read in front of you," commented Patrick O'Neill, CASIS's communications manager. For more about Story Time from Space, see www.storytimefromspace.com or facebook.com/storytimefromspace.